Oil painting on wood panel circa 1860, French school. Oil painting on wood panel 1860, french school. Not signed, needs a cleaning. Dimensions: 24 x 41.6 cm. Bad, very dirty, deserves a clean / bad, very dirty, needs cleaning. All packages are secured, tracked and insured. For a shipment to France, you can request an economic shipment but then we can not be held responsible for incidents that occurred during the routing. Hand delivery and payment in cash are possible only on Saturdays and Sundays at the vanves gate flea market (75014) from 9 am to 2 pm at our stand located at 22 avenue georges lafenestre. Thank you for announcing your arrival by message or phone: 0614336044. Do not forget to add us to your favorite sellers! 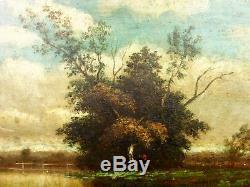 The item "hsp 1860 beautiful landscape in the style of the school barbizon to restore" is on sale since Friday, September 14, 2018. It is in the category "art, antiques \ art of the nineteenth and before \ paintings, enamels ". The seller is "bozart_shop" and is located in stains, Île-de-France. This item can be delivered anywhere in the world.